I needed her to relax her arm so that I could perform some passive massage techniques on her neck and shoulder. But despite her best efforts, and while assuring me that she was totally relaxed, she couldn’t help but tense her body. Instead of letting go, she held her arm actively in whatever position I moved it into. It wasn’t until I did ALL of the following techniques that she finally “let go”: I supported her arm with table wideners, an extra folded blanket and a few eye pillows beneath; I compressed her arm with a good amount of body weight from my own arm and torso; I also gently jostled her body; Plus I cued mindful breathing and awareness to the blind spots that were still holding tension. At this point her arm finally stopped tensing so I could perform my intended massage. Hooray for Kathy! But why did all of this work? And how can it benefit you? Here are two big takeaways, along with a bit of geeking out on the science of why these techniques are so effective. 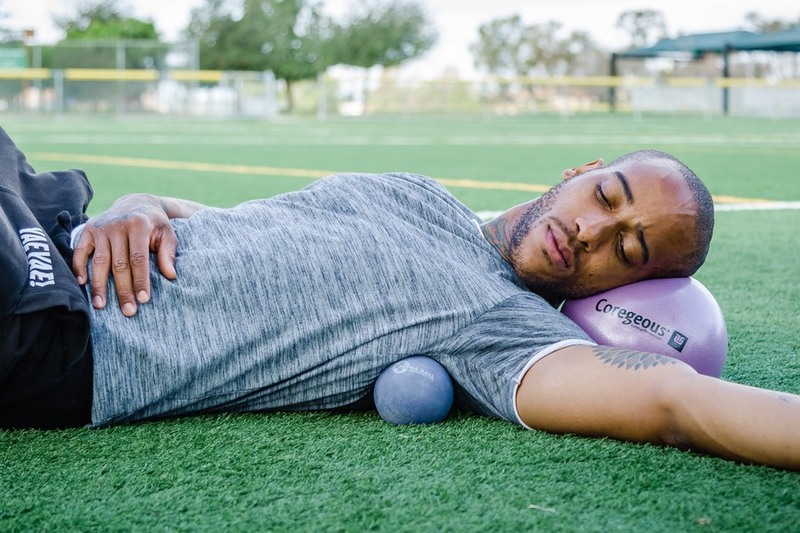 Restorative yoga is typically done with plentiful props for support. But they aren’t always enough for everyone. I have found that having extra cushions, eye pillows, towels, washcloths or whatever else to fill in all of the spaces between the body and the floor is a game-changer. The greater the surface area being supported, the greater the relaxation you’ll experience. I’ve learned to be resourceful — tucking jackets under knees, scarves under wrists and hoodies under ankles. The more support you can provide the better, so leave no surface un-held. Same rules go for compression. In restorative yoga we typically cover up with a blanket. We also sometimes add a sandbag or two to the targeted area of relaxation. In addition to this, I have been known to place eye pillows in palms of hands, blocks on bellies and blankets on foreheads. For my lucky private clients, a weighted blanket goes over the entire body. Look around your living room and I’m sure you’ll come up with some clever ways to support, compress and swaddle yourself. This is not so common in restorative yoga practices, but perhaps it should be. It is hard to remain tense and braced when you’re engaged in fluid movement. Massage therapists will often jostle particular body parts, or rock the entire body on the table in order to trigger the relaxation response. You can replicate this in your restorative practice: Gently shake your limbs a bit; Contract and relax body parts; Rock your entire self side to side once you’re settled in. Why are Support, Compression, Jostling and Rocking SO Relaxing? 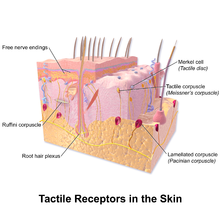 Mechanoreceptors are nerve endings of various types that act as sensors in the body. They relay proprioceptive information about stretching, movement, joint position, touch, pressure and more. By enhancing your proprioception (sometimes called your 6th sense), you get a better embodied understanding of where you are in space. You can literally become more receptive to the support you are offered. You get more aware of the discomforts and tensions you’re holding onto. Then you are more able to consciously let go. Because Kathy’s proprioception in that particular area was diminished, she was convinced she was fully relaxed even when she was actively bracing against me. Ultimately, helping her to enhance her own proprioception is what enabled her to melt into my table. With the techniques listed above we are particularly targeting the following three different types of fascial mechanoreceptors. 1. What are Interstitial Receptors? I’m so glad you asked! Interstitial receptors (aka free nerve endings) are the most abundant fascial mechanoreceptor in the body. They are found almost everywhere, and account for almost 80% of all sensory nerve fibers in a typical motor nerve. These are the receptors we’re talking to when we are providing support and compression (sustained pressure changes), as well as jostling and rocking (rapid pressure change). Because they are so plentiful in the body, the more surface area we stimulate, the more interstitial receptors take note. This is why Kathy was more able to relax when I applied compression with my entire torso than she was when I was using just my hand. 2. But What About Pacinian Corpuscles? 3. And How About Ruffini Corpuscles? They Sound Neat! They sure are. In addition to stimulating the interstitial receptors, providing support and compression to the body creates sustained pressure changes. This, along with shearing forces, stimulate mechanoreceptors called Ruffini corpuscles. When properly stimulated, they create a global decrease in muscle tonus. Basically, “when Ruffini receptors fire, you chill out”. Ahh, isn’t science relaxing? Lesondak, D. (2017). 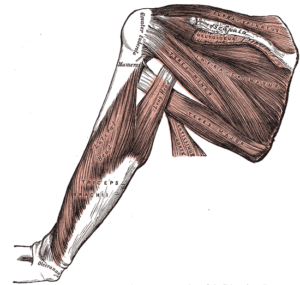 Fascia. Pencatland, East Lothian: Handspring Publishing. Schleip, R. (2017). Fascial Fitness. Nutbourne, Chichester: Lotus Publishing. Schleip, R. (2003, January 1). Fascial Plasticity. Journal of Bodywork and Movement Therapies , 7 (1), pp. 11-19. I had no idea about Mechanoreceptors! and also weighted blankets and sand bags! Im usually anxious person and its very difficult for me to relax. Weighted blankets and sand bags are exactly what i need! Im very excited to try these on me! Thanks to Yoga Tune Up articles i learnt a lot! Im very happy to have found it! Loved learning more of the science behind mechanoreceptors. Spatial awareness and proprioception is something that separates yoga from other fitness modalities and Yoga Tune Up is such an amazing resource to learn more about this type of work in an accessible contextualized way. Never thought about compression and all the information about the receptors in the skin are all information I plan to integrate into my classes! Great article! Thanks for educating me! I always knew that I enjoyed the jostling and compression of massage and now I understand what those actions are doing in the body. I’m going to try out using more props during my next Savasana. Wow! This makes so much sense. I, like your client Kathy, have also experienced not being able to truly relax a muscle even though I thought I was. It wasn’t until pressure was applied that my muscle could respond. Super interesting! I’m going to start using more support and weight during restorative classes. Good info on letting go of tension and helping your patient to enhance her own propreoception. This article is so great to recap the science of mechanoreceptors ! Thank you ! Now I can better understand the action of each receptors and how I can help other people to get relaxed. Riannon Zorn, thank you for your blog post.Really thank you! Awesome. So interesting! to finally know the what and why… so much more easy to understand! That is really interesting – thank you! It is very valuable information about support, compression and jostling, good to know now how it works. Wonderful summary! Off to re read Lesondak and to do some restorative work on myself! Full day ahead. Thank you very well written! This was so fun to read, enlightening and entertaining! In a way, it is surprising how much conscious effort you can apply to increasing relaxation. This is valuable information to know–and these mechanisms are crucial for going deeper into savasana, to transport you into profound states of releasing and quieting both body and mind. It’s also empowering to know that there are easy tools to influence your relaxation response (again, in BOTH body and mind), especially if you tend to spend a lot of time in–or get stuck in–that high-strung, high-productivity, type-A, sympathetic mode. Thank you for writing! I’m curious about why some people seem to have great proprioception and body control, while others seem to lack control over their own body. What role does chronic stress, trauma, and pain play in up- or down-regulating the sensitivity of our mechanireceptors? Thank you for this article. 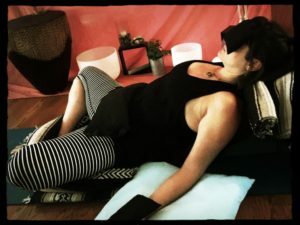 I especially liked the strategies that can be applied to restorative yoga, especially when you don’t have as many props as you wish you did for the entire class! Your suggestions to use hoodies and other non-yoga props were genius. Thank you as well for reminding me the importance of props/covering for students of restorative. This is FASCINATING! I never met compression I didn’t love and I only really sink into savasana when I’m swaddled up. I’m curious why those of us with systemic joint hypermobility have poorer proprioception — what the mechanics are with the connective tissue into the mechanoreceptors.